Editorial Note: article first published as Music Review: Pitchfork Festival 2011 Day One – Righteous Tune-Yards, Animal Collective Deja-snoozes and Harry Potter Shout-outs on Blogcritics. The first day of Pitchfork Festival 2011 might not have sold out with only 18,000 fans piling in to Union Park, a place that can hold around 20,000. But nonetheless the eager fans that did show up were treated to a worthy feast of indie rock, rap and electro-pop. Of the 11 eleven bands that played on three stages, those few bands that I expected to bring the goods did, for the most part. But there were a few that slowly evaporated like mist in the heat of the summer sun ultimately leaving me wanting more. That said, when it was all said and done, these are the performances and fan moments that defined Day One. First: the visions of Tune-Yards’ set. The music that Merrill Garbus conjures on stage with her backing band is so sweet, seductive and immersing that you can’t help but be instantly pulled into her sonic portraits of love, joy, pleasure and pain. Under the canopy of trees at the Blue Stage, Garbus came out for a quick sound check to tweak her snare drum them came back with her band to dazzle us with deft live looping, masterful percussion work, and crooning that somehow simultaneously channels Prince, Sam Cook and Captain Beefheart. Then I voyaged over to the Green Stage to see what prog-rockers Battles was up to. But to my dismay, they were subpar and lacked the same driving power and tenacity that they unleashed during their 2008 Pitchfork set. Maybe it was the sound or where I was standing? Sound issues or not, a good band should be able to make you feel at least something with their set, no matter where you’re at or what technical problems they’re having. And I’m sorry to say that I left Battles after a few songs feeling nothing, and headed elsewhere to explore the grounds, chat with other fans and see what else was going on. Then a hour later, back at the Blue stage, an unexpected shout-out to Harry Potter erupted from the crowd as fans waited for hip hop jester trio Das Racist to start. One mischievous, albeit timely fan, led the charge screaming “I say Harry, you say Potter!” and all the other fans followed suit laughing as we all shouted back and forth. As you see in the video above, the wizard-inspired call-and-response quickly morphed into a rowdy chant for water, and seemingly out of nowhere a security guard appeared in the pit and began handing out free bottles of water to the pinked-faced, mildly dehydrated and sweat-drenched fans in the front row. Shortly after this strange series of events, Das Racist swaggered on the stage and sloshed their way through a zany set of songs filled with sly, semi-intelligent, joke-filled rhymes about money, race and wild parties from their forthcoming debut album Relax. Wrapping the night up was electro-jam-rockers Animal Collective. And boy was it an odd a case of deja-snooze as I was shot back to 2009 when Animal Collective closed out Saturday night with a no-direction and overly insular set of synthy jams and mis-directed psychedelic ravy lightshow. So yet again, even though they are pretty amazing on album but not so good live, Animal Collective was given the honor of closing out the day. And as I headed home I thought it would have been so much better to experience Tune-Yards taking us to the end of an otherwise solid start to the festivities. Next Up for Day Two? Fleet Foxes, DJ Shadow and who knows, maybe some more Harry Potter shout-outs? And if you’re looking for a great mobile guide to the festival, be sure to download the Pitchfork iPhone app. It rocked. And it’s one of the best festival apps I’ve ever used! 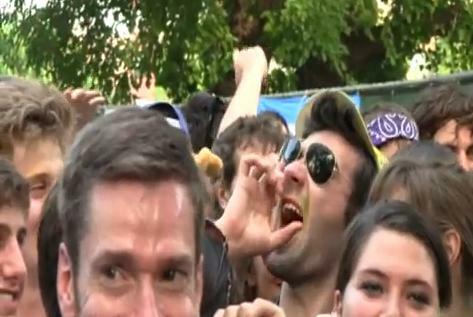 Were you at Pitchfork? We invite you to share your Pitchfork concert experiences in the comments below, so they can be included in a future episode of Live Fix Radio.